Dr. Gargiulo is a reproductive endocrinologist and reproductive surgeon at the Center for Infertility and Reproductive Surgery and the Boston Center for Endometriosis at Brigham and Women’s Hospital in Boston. 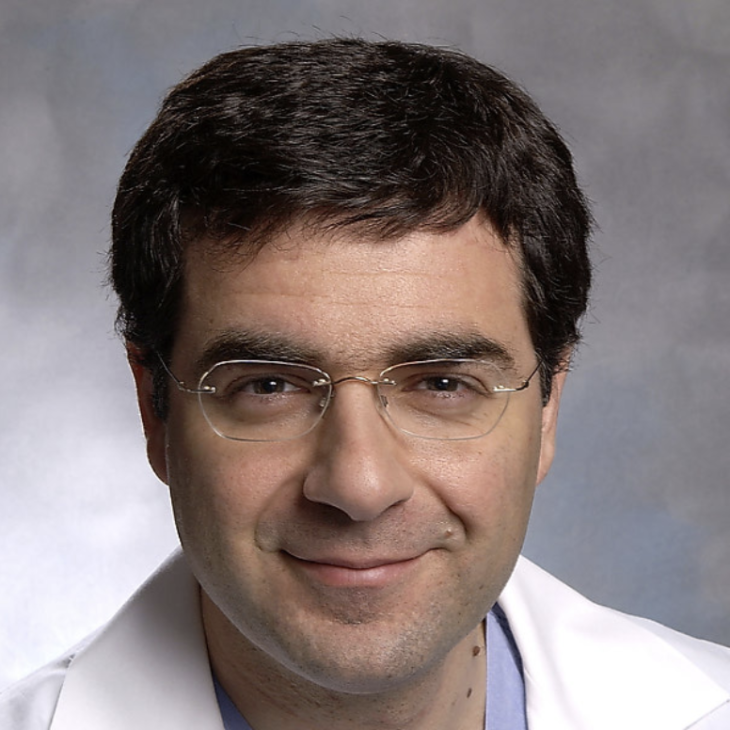 He is the Medical Director of Robotic Surgery for Brigham Health, and an Associate Professor of Obstetrics, Gynecology and Reproductive Biology at Harvard Medical School. There is only one myomectomy, and it is microsurgical. For women experiencing the pelvic pain and heavy, irregular periods associated with uterine fibroids, we have long been able to provide safe, effective tumor removal and symptomatic relief. 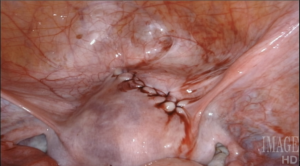 Myomectomy is now one of the most common gynecologic operations in women of reproductive age, as what once was a highly morbid alternative to hysterectomy has become a very safe surgery. 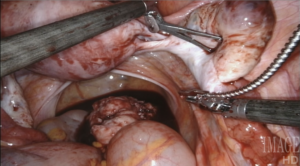 This operation represents the quintessence of reproductive surgery. 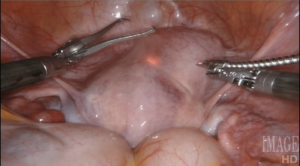 Indeed, in all of its forms, invasive or minimally invasive (hysteroscopy aside), myomectomy is a microsurgical operation: myometrial, endometrial and tubal preservation, hemostasis, precise tissue apposition, reconstruction in layers, and absence of exposed suture are all essential to its success. There is one fundamental point that gynecologic surgeons must acknowledge: there is only one myomectomy, regardless of access modality. We are held to identical operative standards, whether or not we open the abdominal wall to perform this operation. Our patients do not expect to undergo a “simplified” uterine surgery when they agree to minimally invasive surgery. I have always been eager to adopt technologies that advance these goals, and make myomectomy the best operation that it can be. Today, in my opinion, the epitome of microsurgical myomectomy is a robotic myomectomy with a CO2 laser. Virtually all women’s reproductive surgeries have been performed endoscopically for decades, making these procedures less invasive and painful than what can be achieved with open surgery. As surgeons, we are fully aware that the move away from open surgery has completely changed how we interact with tissue. 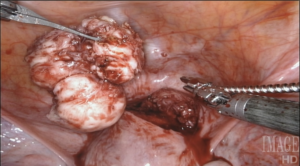 In the case of myomectomy, for example, we can no longer excise and enucleate fibroids from multiple angles. We also generally misuse thermal energy, in order to limit blood loss. Use of monopolar and bipolar energy, both virtually unknown in classic myomectomy, has become the norm for minimally invasive myomectomy. This, in particular, is a major step backward in technique: it is the ultimate “simplification” that we have chosen to adopt, even though we understand that it breaks the rules of microsurgery. 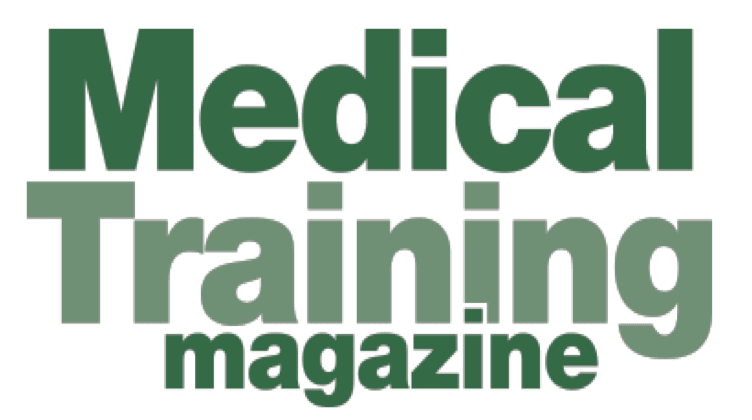 Our field has been known to succumb to the lure of simplifications and shortcuts, and the backpedaling that was required of us from open tissue morcellation is a recent, dramatic example of this dangerous attitude. It is time, in my opinion, that we consider applying all the technology at our disposal to make myomectomy a microsurgical operation again. Robotic surgery offers flexible tools, that articulate in every direction, giving back the wrist to endoscopic surgeons (only, with greater flexibility than any wrist, tremor cancellation, and full ambidexterity). It also allows us to see and work in three dimensions, a feature that is extremely helpful to access and remove fibroids in hard-to-reach locations. 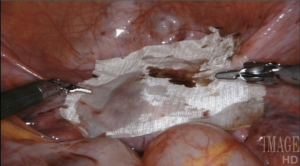 Using a laser fiber as the primary cutting tool in robotic myomectomy not only capitalizes on flexibility, but also practically eliminates any thermal injury to reproductive tissues. Its lateral thermal spread is on the order of 100 microns, whereas electrocautery has a lateral thermal spread of several millimeters but injuries have been described even several centimeters away from the point of application. Consequently, with the CO2 laser, we know we cut only what we intend to cut, with no delayed burn injury. I have ten years’ experience in the use of the CO2 laser for myomectomy and currently use the Lumenis UltraPulse Duo CO2 laser with FiberLase waveguide, with a minimum spot size of just 0.5mm. The fiber is inserted into the Drop-in Guide, which is a flexible cannula that allows the robot to naturally grasp and manipulate positioning of the fiber. The spatulated tip of the Drop-in Guide is consistently cold, so we can use it to mechanically dissect delicate tissue without any damage, even immediately after lasing. 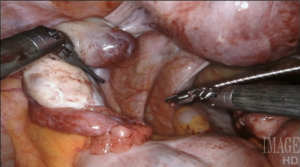 An added advantage to using the CO2 laser for myomectomy is that it can be very effectively used in the chance of concurrent endometriosis findings. In my practice, a good number of patients with fibroids also have endometriosis. The flexible CO2 laser allows us to treat endometriosis of all degrees and types, with minimal negative impact on the patient’s fertility. 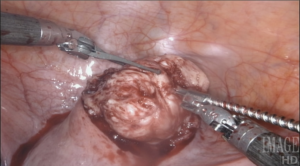 Of all the myomectomy approaches available today, robotic myomectomy with the CO2 laser is the minimally invasive option that is also the least damaging to the uterus. Hundreds of my patients have gone on to achieve and complete healthy pregnancies, including many IVF twins and even triplets, without a single uterine rupture. Our approach to microsurgical myomectomy has certainly paid off.